Hey Parents, Happy February! We’re starting a new series called Unbelievable. 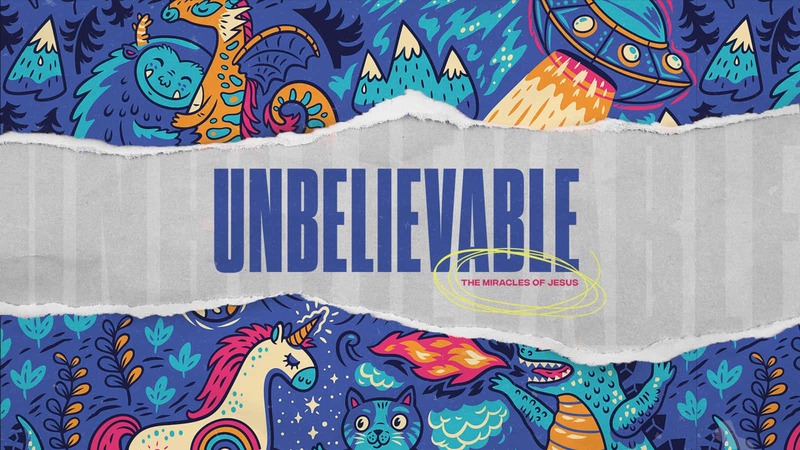 Kids will have fun learning about some of the unbelievably amazing miracles of Jesus. Mark your calendars; we’re getting ready for an awesome family Easter event that you won’t want to miss! Families will have the opportunity to dive into the Easter story in a fun way! Kids love using their imaginations and playing make believe! It’s fun to be creative and play with unicorns, dragons, doll houses and LEGO bricks. But with all the things in our world that are unbelievable, kids need to know what is real and true. They need to know we can trust that God, His Word and the incredible real miracles of Jesus. In this series, kids will learn that God did things that seemed impossible and unbelievable, but those things were very real ways of showing us His power and His heart. This series will teach kids that God cares about us when we are sick, Jesus cares about us when we’re afraid, Jesus can provide for our needs, and Jesus can do the impossible. Kids love being leaders and doing valuable work. Teach them that leading also means serving others. Give them opportunities to serve and lead both in and out of the home. And let them see you leading by serving others. When you see them serving affirm and encourage them. God is shaping right now through everyday opportunities of growth. Check out this new book by Bobb Goff and Lindsey Goff Viduchich to help your kids view their faith as an exciting adventure. It is filled with true stories from Bob Goff’s life and inspiration just for kids. Kids will be encouraged to do big things for God to make a difference in the world. Hey parents, help us out. What’s one thing our church could do to better serve and help you? Hit Reply and let us know!